Last week I showcased a giveaway with 4 GoGo vouchers as a celebration for the GoGo and BoardingArea partnership. GoGo is running a large competition which you still have time to enter here however there are only two days left! My giveaway finished last night and I had some great responses for which I am happy and grateful. 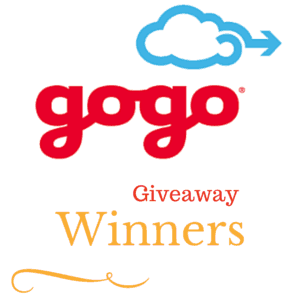 I picked (well the system) 4 awesome winners each of whom won a GoGo internet vouchers for their upcoming flights. Congratulations to you all. Thank you very much for entering. Expect an email from me shortly.